For Dirtier, More Corroded Metal Surfaces. A medium cut metal polish for use on dirtier, more corroded or more degraded metal surfaces. 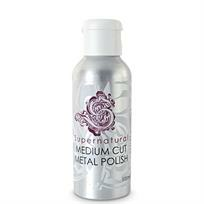 Supernatural Medium Cut Metal Polish has the capacity to remove deeper contamination and surface damage than finer grade polishes. As with paint polishing it is always best to "step down" after a more aggressive cutting stage and use Supernatural Ultra Fine Cut Metal Polish afterwards to refine the finish.